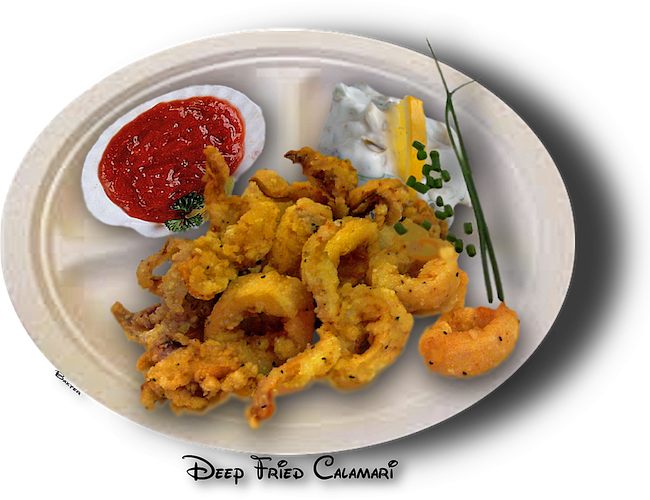 CRISPY FRIED CALAMARI RINGS AND TENTACLES - A DELIGHTFUL WALK AND EAT STREET FOOD SNACK. The lowly squid has risen to pinnacles of delight for foodies all over the world. In the early 1950's as a sailor in the U.S. Coast Guard, I used to get laughed at for trying to buy squid on the docks in Monterey, California. The folks there on the docks knew it as fish bait and would give you a bucket full for nothing but a smile. Once in a while I would get charged fifty cents for the bucket full and I'm sure they laughed at me as I left. Now you are lucky if you could buy that bucket full for 8-10 dollars. I'm reminded that I use to get an abalone steak for 2 dollars at a restaurant on that same dock. Times have changed and so have our tastes. part of the squid. Don't be afraid to use them. Use the tentacles whole and do not cut them up.